For the past several months, political pundits and sports journalists have spent a great deal of time speculating on the impact of Russia’s strict anti-LGBT stance and laws and the impact they might have on the Olympic competitions. Against this backdrop, Michael Sam, a senior defensive lineman from the University of Missouri, announced, in an interview with ESPN, that he was gay. This revelation has generated all kinds of responses, reactions, and rejoinders concerning the impact of a self-pronounced gay player in an NFL locker room. The feedback from those associated with the NFL have varied quite widely from the boisterous rage of Herman Edwards, a former NFL player and head coach, to a very politically correct press release by John Elway, Hall of Fame quarterback and current vice-president and general manager of the Denver Broncos, to the well-articulated opinion piece by Dallas sportscaster Dale Hansen, which has now gone viral. The NFL itself has been quietly measured with its response to the Sam announcement. While Mr. Sam’s announcement has created a beehive of activity among NFL associates and the sports press, responses from the college ranks have been positive and supportive. Several college coaches have stated that they would be (are) very accepting of a self-identified gay player. College football players, especially Sam’s Missouri teammates, have expressed strong support for teammates who are or may be openly gay. As stories are published in print and social media, and reports are aired via television and internet, I find myself wondering why this is receiving so much attention. A young man who is about to graduate from college and join the workforce shared that he is gay, end of story. If this young man were preparing to be a teacher, a chef, a salesperson, even a financial fund manager and he announced he was gay, no one would care. There would be no stories in print, no televised interviews, and no commentary concerning how this might impact the young man’s profession. However, because he is football player—and a rather talented one at that—his sexual orientation is now a matter of societal conversation. 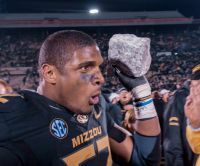 Michael Sam will now receive an incredible amount of attention as he participates in this coming week’s NFL Combine (tryouts) for college players wishing to play in the NFL. Mr. Sam will be followed closely as he travels to individual teams for interviews and additional tryouts, all the way up to the NFL draft held in May. Along the way, every move, every physical action, and every phrase that emanates from Mr. Sam’s person will be analyzed and speculated on in light of his being gay. Even the round in which he is drafted will be evaluated in light of his acknowledgement of his sexual preference. There are several aspects of this story that are very unfortunate and that serve only to confuse the cultural conversation concerning LGBT individuals and their place in society. First, the amount of attention Mr. Sam will receive in the coming weeks and months will only serve to discourage other LGBT individuals from “coming out of the closet.” This will be particularly true for younger individuals who have not yet claimed their sexual preference among family and friends. As these young people watch and listen to all the speculating, as well as the hateful and hurtful things said about Mr. Sam, it will simply reinforce the lack of safety and security our culture provides for LGBT individuals and couples. Second, now that Mr. Sam has publicly stated he is gay, he will probably be badgered, berated, and worse by other players on the field. He will probably suffer cheap shots in the open field, as well as being verbally and physically harassed in the pile-ups that occur on almost every play in a game. He will likely be shunned by some teammates, and perhaps, even by coaches on the team for which he will play. As Mr. Sam tries to make an NFL roster, he will have to play a little harder, make a greater effort, demonstrate he is smarter than the straight players on the team in order to make the team. As the public, we will not hear about these things happening because they will be hidden behind rules requiring players and coaches to be quiet and not acknowledge such activities are going on. Finally, those close to him—family and friends—probably will also suffer ridicule, and even abuse, because of Mr. Sam’s orientation. What should be a period of time filled with pride, smiles, and joy will be shrouded in the hurtful words and actions of people who were once considered close friends and supportive family. At one point in Dale Hansen’s opinion piece he talks about the need for the NFL—its leaders, coaches, and players—to grow up and learn how to respond with maturity to the presence of players like Mr. Sam on the field. I would take that statement further. It is time for our society to grow up and demonstrate greater maturity in caring for and supporting our LGBT friends and family. This is what existential psychology teaches. It is time for society to acknowledge people of different lifestyles and ethnic backgrounds as simply being different, not bad. It is time for our churches, synagogues, and related religious institutions to stop equating LGBT individuals or couples with evil; or different expressions of faith and spirituality as wrong and damnable. Athletes from all over the world, many of whom are gay or lesbian, have gathered to compete in peace with one another. As the Olympic Games have gotten underway, the chatter concerning LGBT issues and concerns has quieted. The athletes are focused on getting to know one another, and be encouraging of one another. For many of these athletes, the Olympic experience is a broadening of their worldview and perspective about other people, cultures, and orientations. It is time our society; our sports; our businesses; our communities; and our neighborhoods step back and broaden our worldview. We can’t just do this in only in the consulting room. It is time that we as individuals and communities change our perspective in such a manner that the sexual preference of a young man who plays football is no longer worthy of attention.